Chris is an amazing instructor and very kind. She has gone the extra mile to help me with the classes as I am now working fully time, really appreciate that! The lessons are well organised. She has trained me not just to pass the test first time but to be a safe driver. Strongly recommend her! 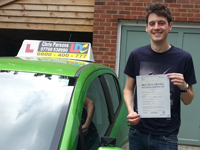 I would highly recommend Chris who helped me pass my test first time. Chris always remained calm and explained everything clearly, going at my own pace so I never felt overwhelmed trying to take all the information in (I had never driven a manual car before). Always on time and after every lesson Chris made me leave feeling very positive.... even when I had made silly mistakes! Once again, Thank you Chris! 10/10 Chris always had so much patience and made me feel confident in every lesson. I would absolutely recommend her to anybody. 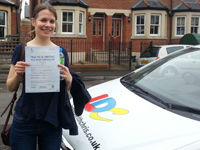 She made learning to drive a great experience for me and with her brilliant teaching I managed to pass 1st time! Chris made me feel comfortable and at ease from the very beginning. She's very calm and patient when any mistakes are made and fills you with confidence. I would definitely recommend her to anybody. I have had my provisional licence for about 8 years now. 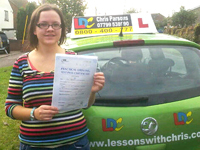 After a few lessons which put me off driving from an awful instructor, I was recommended to book lesson with Chris. I started lessons at the end of Feb 2018, passed my theory test first time in June and have just passed my practical test first time now in July. Chris has been a fantastic instructor! So calm and reassuring and has built my confidence as well as my driving skills in the short space of 5 months! I work a 4 week shift pattern and am also heavily pregnant and Chris has been amazingly understanding and flexible to suit my needs. 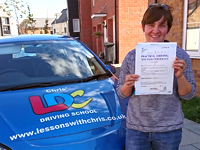 Driving has been a massive challenge of mine for a long time and after each lesson with Chris I felt I had progressed and achieved goals without being pushed or put under pressure. I would highly recommend Chris to anyone learning to drive and I will miss my driving lessons with her! Thank you Chris! I started learning to drive with Chris after a negative experience with a former instructor. He was short-tempered, unfriendly and made me very uncomfortable and nervous. I was absolutely delighted to find that Chris was the polar opposite: never raising her voice once, always in a good mood and an excellent, patient teacher who helped me rebuild my confidence. 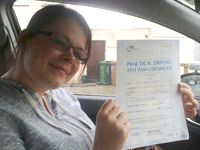 With her help and expertise, I managed to pass my test first time - I would strongly recommend her to anyone. Thank you very much once again Chris! Thank you so much Chris for all your help and support to enable me to pass my test 2nd time. I always looked forward to my lessons with Chris, I felt comfortable and that I was always learning in a way that worked well for me. 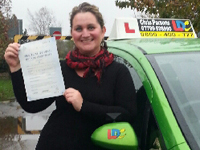 I give Chris a massive 5 star rating and would recommend her to anyone who wants to learn. Thank you so much Chris. You were a brilliant instructor and I would recommend you to anybody looking to pass their test and become a good driver. Always on time, extremely patient and helpful, and helps you not only pass but be a safe and confident driver as well! I highly recommend Chris as a driving instructor, especially to anyone from another country who is hesitant about driving on the "wrong" side of the road! Having learned to drive in the US, I had put off getting my UK driving license for 17 years and had never driven in the UK prior to working with Chris. Thanks to much patient driving instruction from Chris, I got my UK license. It's wonderful to feel more confident about driving in the UK and to feel more at home here because of it. I am sure I'll be a safer, better driver now wherever I drive. My family and I thank you Chris! When I first started driving lessons I had never driven a car before and knew nothing about cars. Chris was very professional in every lesson and taught me how to remain calm and safe while driving. It really helped because I was always nervous before driving. Chris was also very patient and talked me through exactly what I needed to do if I made any mistakes or started to panic. It really helped me as Chris would explain in detail what I needed to know if I did something wrong. I learnt so much and never expected I would pass first time. I would definitely recommend Chris. When I started driving with Chris I was a very nervous driver and had no confidence at all. I never thought I would get this far and have the confidence I now have. Chris really cares about her students and never made me feel uncomfortable if I got something wrong. She has amazing patience and I couldn't recommend Chris enough. I'm truly very grateful. Tim learned to drive with his Mum and unfortunately failed his test 3 times. After the 3rd attempt he came to me for help. " 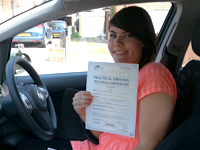 Hi Chris, I got A.... for the 3rd time for my test today and passed with one driving fault for inappropriate speed! I certainly had to apply what you taught me today as I had a few meeting situations. So want to say thank you, couldn't have done it without your help.I will be sure to recommend you in the future. Take care and thank you, regards. Tim. Thank you Chris for being so patient with me and helping me to pass my test first time. I found lessons very enjoyable as you always stayed calm which made me feel a lot more relaxed and feel less pressure if I made a mistake, but I am grateful that you always explained how I could improve in a reassuring way. I have also really benefited from being taught thoroughly so that I felt fully prepared and confident when I went for my test. Thank you for all your help Chris. Thank you so much for teaching me to drive. After initially learning to drive 4 years ago with a poor instructor I was sceptical about having lessons again. Chris is a highly approachable, kind, calm and honest instructor - which is exactly what you need when under pressures of learning to drive. 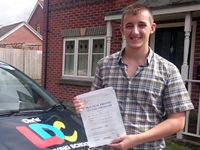 With Chris' support and assistance, I managed to pass my test first time. I couldn't have done it without Chris so thank you very much. I would 100% recommend Chris as a driving instructor. 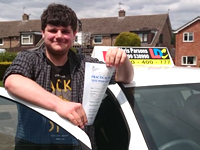 Chris Parsons is an excellent driving instructor – patient, highly knowledgeable, and understanding. She helped me unlearn 30 years of driving experience in another culture, which was a huge task, and then replace it all with new ways of seeing and doing things. She did this by taking on small tasks each time, according to my improvement. 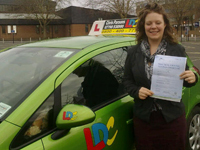 It enabled me to achieve a very good pass and helped change my life. 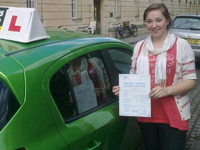 She wanted to teach me not only how to get through an exam in Oxford but to drive safely anywhere. She is to be highly recommended. I would particularly recommend Chris to anyone who is nervous or scared of driving. As an American who has recently moved to the UK, I was overwhelmed by the differences between US and UK driving styles. Chris was always patient and understanding. Even when I made the same mistakes multiple times, she remained calm and reassured me that I could do it. Halfway through my lessons, I had a baby and was worried that Chris wouldn't be available during the limited times that I could leave my baby with someone else. I didn't need to worry because Chris worked with my schedule to ensure that I got to test standard. She is committed to seeing her pupils through to their tests once she has started with them. I passed the first time with one minor fault! Thanks Chris! I found Chris' style of teaching very reassuring and easy to understand. I also benefited from the patience and calm manner shown throughout my lessons. I always felt nervous before most lessons, but as soon as I got in the car, Chris always had a way to make me feel at ease. She always made everything easy to understand and was willing to take more time to explain if needed. I can't thank you enough for helping me pass, Chris. I would easily recommend you to anyone I know looking to learn to drive. Thank you again. 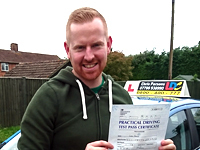 Chris, thank you so much for helping me pass my test with only 3 driving faults! Really appreciate the confidence and ability you gave me to do it. Well done Ben on passing your test first time, and I am glad you enjoyed driving the family all the way to Bournemouth and back - well done! I really enjoyed every lesson I had with Chris as I felt like I achieved something different every lesson. I found it really useful all the little tips Chris gave me, and if I didn't understand anything, Chris would explain it in detail and via drawings if necessary which was really helpful. 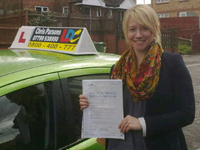 I think Chris is an amazing instructor and would recommend her. Another successful US-to-UK driving convert! Chris was brilliant and experienced with Americans. She had a knack for knowing when to push me a bit to self-evaluate or work something out myself, and when I was frazzled and needed to be told something. She was very patient with my nerves and when I made mistakes, and always made sure I understood the reasons behind things, which was fantastic. A million thanks! I would just to just say a big Thank You to Chris. I never believed I would pass my driving test First time. Every week I would feel very nervous, but as soon as I got in the car with Chris, she made me feel at ease. She was reassuring in my abilities to drive safely and confidently. 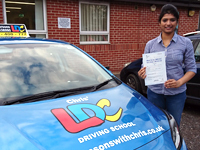 Along with the help of the LDC workbook, manoeuvres and general driving skills were made so much easier to understand. I always looked at the workbook and this also helped me prepare for the practical, what to expect therefore I felt less nervous, than I would have without it. Again Chris thank you so much!. 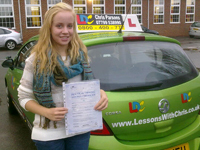 I would recommend you, without hesitation to anyone looking, for an excellent driving instructor. Chris is a fantastic driving instructor. She's attentive, helpful and very knowledgeable. No matter what question I brought with me to a lesson Chris would always have a precise answer for me that she explained in a way that I could understand. Chris helped me build my confidence, teaching me to drive safely no matter what the situation. Chris teaches very thoroughly so you never leave a lesson feeling like you haven't developed a skill or achieved something, and you always feel confident. She encourages you to progress but always at a pace to suit you. Never moving forward until we were both happy with each step - always being patient no matter how many times I asked to try to do a bay park. Chris is always honest but she gives the nicest criticism, always offering advice and support. I would recommend her to anyone and everyone. She's so great. Thanks Chris! Chris teaches you not only how to drive a car, but how to drive safely and to feel confident behind the wheel. One of the most organised people I have ever met, yet is so flexible with her teaching style and times to fit your needs. I have already recommended her to numerous people! Chris was able to convert me from an American driver to a British driver; a non-trivial transformation. But we did this over several 2 hour lessons and I managed to pass my driving test the first time. 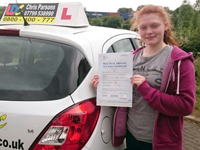 Chris has high expectations for her drivers, but you eventually come to realise that her expectations are placed perfectly for making you a safe driver and one that will pass their test first time around. 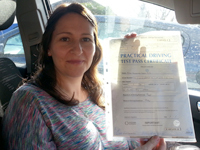 Her firmness but friendliness is a perfect combination for her role as a driving instructor, as you always know what is expected of you and what to expect from yourself. 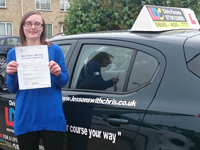 I would recommend Chris to the full range of learner drivers (young to mature); she is very methodical about ensuring you experience all the typical driving experiences in Oxford (which is where I was learning). I felt confident going into the exam that I shouldn't be surprised by anything that was asked of me--and I wasn't. Now that she has taught me and my wife (both Americans) she is more aware of the language and cultural differences between being an American and British driver, so I would certainly recommend her to any Americans in the future as there are more differences to be aware of than you might think; my favourite being "pull up behind that car"...for which I had at least 4 different interpretations--I'll always laugh at the memory of how I reacted to that request on the exam--inside joke! Thanks very much Chris!! Thanks, Mum, for helping me pass my test with just one driving fault. I am so happy to be out on the road. Don't worry, I will still drive you around when you want! Supportive, confident and reliable are just a few words to describe Chris Parsons. It's not uncommon for a student to feel nervous before their first drive on the road, but Chris has the remarkable ability to make you feel calm and focused to what's going on around you. Although you will always have the freedom to make and learn from mistakes, you can take refuge in the fact that Chris will always keep you safe as she is always alert and responsive to your actions. She is enthusiastic about everything you do and ask, making sure that you are equipped with all necessary and further driving skills for the test and future driving. 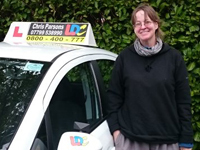 It was an absolute joy to have Chris as my driving instructor and I would thoroughly recommend her to anyone looking to have the greatest chance of passing their test first time! 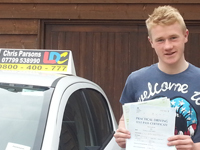 Just a quick note to say thank you SO much for all your help with Harry - he is so delighted to have passed first time! You have been totally great with him and just what we needed - very much appreciated. 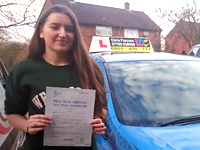 em>Well done on passing your test first time today, Isobel with just 3 driving faults! Thank you so much for the lovely chocolate! "You're welcome Chris, I'm glad you like it. 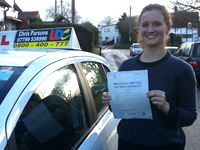 Thank you for being an amazing driving instructor and for helping me to pass my test!" I would recommend Chris without hesitation. Before my first lesson I was extremely nervous about driving and - if I'm honest - didn't really expect to end up as a qualified driver, but I have now passed my test and have even gone for my first solo drive! 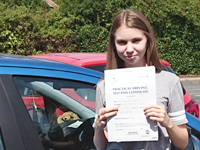 I couldn't have done this without Chris' patience, calm attitude and superb organisational skills - she really does know what she's doing and her thorough knowledge of the area was especially useful as I approached my test. Thank you, Chris! 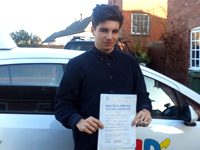 A big thank you to Chris for helping me to pass my driving test first time. I always felt very nervous before each lesson but as soon as I got in the car with Chris she always made me feel comfortable and relaxed. She is a great teacher, very friendly and patient, and was always on time. The LDC system of learning was brilliant. It was easy to follow the CD for my theory test, and the workbook was a great help to read before lessons. Thanks again Chris for getting me through my test. I am so happy it will make such a difference to me and my family. I was very nervous before my first lesson as I was totally new to driving and didn't think I would enjoy it. I also had a small time frame - I wanted to pass in just over 3 months. Fortunately, Chris was a fantastic instructor and very accommodating. 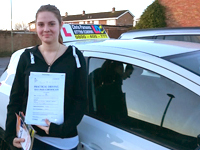 She made me feel at ease from the start and, as a result, I really enjoyed learning to drive. She is calm, patient and supportive and explains things clearly. Even when I was feeling stressed and lacking in confidence, she was positive and made me believe in my abilities. Additionally, The LDC workbook is great and provides a good framework for lessons. I felt well prepared for both my theory and practical tests. 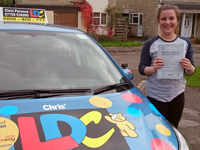 I passed first time and this is really down to Chris's excellent teaching! I know driving will give me so much more freedom and I'm glad to have learned with such a lovely instructor. Thanks Chris! Highly recommended!" 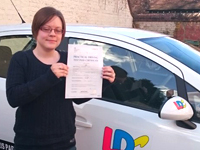 Based on my experience receiving driving tuition from Chris Parsons, I can highly recommend the LDC system. 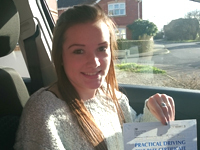 At my first lesson, I received the LDC workbook which is clearly written and easy to work through: I especially found "The Driving Test" section useful to give me a clear sense of what to expect on test day. 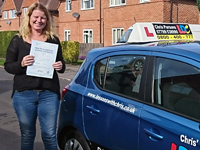 I would describe my instructor, Chris as knowledgeable, patient and friendly; she was always on time for lessons and kept a systematic record of my progress. I passed both my theory and practical tests on my first try, and I attribute part of my success to the guidance received in lessons. I will be recommending both Chris and LDC to my friends in the area. 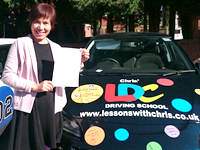 My experience of learning to drive with Chris Parsons and LDC have been extremely positive. Chris is an extremely experienced instructor who made me feel calm and confident. Never shouting or getting angry whatever I did. She allowed me to have input into what each lesson could involve and the pace at which I was learning. 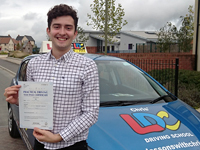 Chris is extremely personable and easy to get on with making the lessons feel relaxed. The LDC method also encourages the learner to be involved in lesson plan and planned outcome from that lesson. I loved the LDC book which you use before each practical lesson so you can read the theory of what you need to do therefore saving time and money. Also having the book to refer to when unsure was brilliant, this was especially useful before the theory and practical test. I passed my test first time with only two minor faults which is testament in itself to how great Chris and the LDC method are, I thoroughly recommend learning with Chris. Thanks Chris. I actually really enjoyed learning how to drive, but I had to focus hard on the things that I found more challenging, such as roundabouts! At first I tried to put off practising them, but actually the best thing to do was practice over and over again! Goodness knows how many roundabouts I've been on! The practice made such a difference because when it got to my test I was so used to lessons that it wasn't as scary as I thought (I was still scared though). I also learnt observation is key and they don't just make you do it for the sake of it! If you practice checking in your mirrors and blind spot, then you soon do it naturally, as part of the manoeuvre! 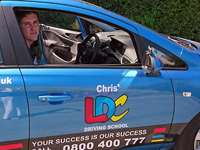 LDC was a great and organised company to learn with and I would recommend Chris to anyone wanting to learn how to drive! Chris has been great throughout the entire learning process; calm, understanding and most importantly , patient! I felt like an individual student, rather than just another faceless learner as we constantly focussed on things directly relevant to me and my driving. Thoroughly recommended! Thank you for your kindness and patience when teaching me how to drive. I felt very comfortable and was put at ease straight away when learning as I could ask you any questions due to your friendly personality. I really looked forward to every lesson because I liked the idea of choosing what I could practice. You're a brilliant instructor and would certainly recommend you to anyone. Thanks very much. I previously had lessons with different instructors for about a year and was going no where. My confidence was low and I lacked the technique to even think about attempting to pass. Chris was warm, encouraging and managed to make me feel at ease behind the wheel. She was able to put everything in terms I could understand and always encouraged discussion so that I was prepared to drive in the real world as well as for my test. Now, I can't imagine not pootling about in my car! 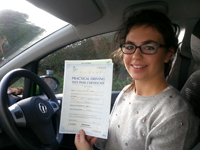 Without a doubt, the best driving instructor I have had the pleasure to drive with! Thank you Chris! 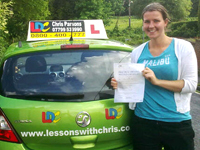 Chris, I really enjoyed learning to drive with you and each of your lessons is focused and well structured. The routes you chose for each lesson always matched the stage I was at (not too easy or too difficult), and you never wasted lesson time with lengthy or unnecessary explanations. You provide relevant and positive feedback, but also know when to offer necessary and constructive reminders to make sure I would continually improve. You are friendly and reassuring and I always felt relaxed with you and that I was learning! Thank you for helping me pass my test first time, Chris. I have never been happier! Chris is really lovely. She's very easy to get along with and her instruction is clear and easy to understand. She is always on time and professional. I would highly recommend her to anyone. Chris, your teaching was excellent, really patient and supportive, and you give good clear instructions. Thanks again for all your help! Without your help I honestly don't think I would have passed 1st time, as my previous instructor made driving very stressful and not enjoyable. Your way of teaching is excellent and helped me to be at ease whilst driving, with constant praise and encouragement from you. I want to say thank you to Chris for helping me to learn and giving me the confidence to drive. 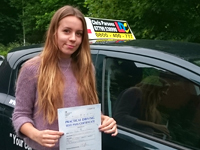 I had previously had lessons with a different instructor and had found driving difficult and frustrating and really disliked it. 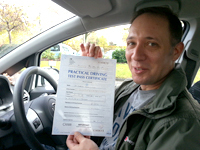 Chris was a very patient instructor who helped build my confidence and made me relax and even start enjoy driving. 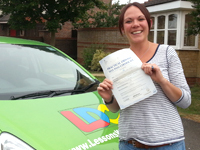 I would definitely recommend lessons with Chris as her friendly and patient attitude are second to none. Thanks Chris! Thank you again for all your help and patience in teaching me to drive and preparing me for my practical test - the fact that I passed first time is a real testimony to your excellent teaching, as when I first started lessons with you I had very little confidence in my driving ability and never really believed I would be able to drive as confidently as anyone else. Previously I'd had numerous lessons with two other instructors, and I didn't feel like I made any progress with them at all, but after our first lesson I already felt on my way to passing my test and being a pro. You have a knack of explaining things in a way that your students can really relate to, and finding strategies to help your students figure out how to do manoeuvres that really pays off in test conditions. I've already recommended you as a driving instructor to everyone and anyone I've spoken to... I hope to squeeze in a few further lessons for motorway driving with you soon, as I wouldn't trust anyone else to do such a good job at teaching me! Thanks again! I have great appreciation for the way Chris taught me to drive. Her way is practical and informative - attending to the detail of a situation and then looking at the bigger picture of how our presence on the road effects other drivers, and how their presence effects us. I really enjoyed being able to relax into my lessons and finding my confidence as a compentant driver. I just wanted to say thank you so much, I had almost given up on trying to learn to drive after my previous lessons, and I never thought I would get through my test. But when I started having lessons with you, you really helped to build my confidence and skills in half the time I thought it would take! I have been doing lots of practicing so far and I am starting to relax and enjoy myself a little bit! Thank you. Thank you so much for helping me to pass my test first time! I didn't think I could do it after making virtually no progress with my previous teacher! It made all the difference to learn with someone as patient and understanding as you and I wish I'd come straight to you in the first place! The card you sent me after was also really lovely! Thank you so much for your help! 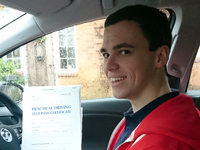 Without the patience and great teaching ability of Chris I'm sure I wouldn't have passed my driving test 1st time. She has the ability to put you at ease and gives clear instructions and good encouragement and has the balance just right. I wouldn't hesitate to recommend her to anyone wanting to learn to drive. I just wanted to properly say thank you for helping me pass my driving test. Your patience and understanding made learning so much easier, as did the fact you didnt shout even once at my mistakes! Knowing what we would be doing each lesson in advance and referring to the workbook meant I was prepared and not at all nervous about moving on to the next steps. Any queries I did have you explained thoroughly and didnt mind going back over things to make sure I fully understood. 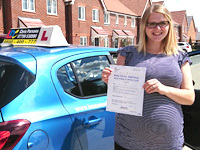 I would definitely recommend you, I'm now a confident, happy driver thanks to your reassurance and enthusiasm! Thanks again, Kim. I just want to say thank you very, very much for teaching me to drive. I really enjoyed my lessons with you. Your lessons are really well-structured and your instructions and feedback are always very clear. I'm also impressed that you always managed to stay calm and cheerful, even after the most stupid of my mistakes. I'm really pleased to have passed and very excited at the prospect of getting a car. All the best. Chris was an amazing teacher. Her positivity and patience were two of the many characteristics that struck me almost immediately after starting my driving lessons with her. She not only tailored lessons to best suit my progression but was always happy to give advice and answer questions no matter how trivial they might have seemed to me. Shortly after starting my lessons, Chris gave me an estimate as to how many I would need, this was less than the DVSA average and also proved to be accuurate. 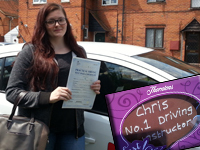 I have already recommended Chris to several of my friends who are considering taking driving lessons and will be continuing to recommend her to anyone else who is wanting to learn to drive. 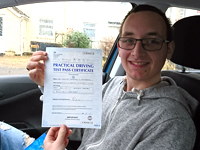 Thank you Chris, for all your help and support in helping me to pass first time. I wanted to say thank you for your support and patience, which helped me to pass my test the first time! Since passing I have been driving everywhere and it is one of the greatest feelings to finally get rid of those L plates and go out on my own - I even volunteer to be the designated driver now! You were always so patient with me (explaining Oxford roundabouts more times than I can remember) and gave me confidence in my own driving ability. I am certain that the standard of teaching I received through LDC with yourself could not be matched by another instructor and would recommend you to anyone who wants to learn to drive. Thank you so much. 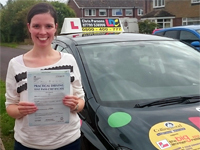 From the beginning when Chris arrived at my door to give me my first driving lesson, I was struck by her positive demeanour and open, friendly smile. 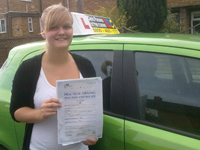 I intuitively felt a confidence in her as a teacher and a professional driving instructor, which proved to be well founded. Chris in an instant put me at ease, which is no small feat. I lacked faith in myself that I could ever drive in busy towns, around roudabouts, off and on slip roads, let alone remember and carry out the rules of the road! At times I did have difficulties retaining information - being 62, my age was a bit of a drawback - yet Chris was so very patient with me. Nothing was too much trouble for her. She drew me diagrams, had to repeatedly explain certain points, she kept notes of each lesson and referred to the excellent LDC book with which every learner is presented. During the lesson, while Chris was always calm, she didn't miss anything and relayed the utmost importance of driving well, with clarity. 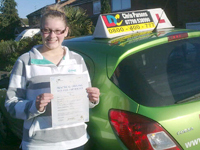 Her driving lessons consequently are an inspiration, and her great gift is........ she gives you self belief! - I passed my driving test second time. I now look forward to seeing Chris again for pass plus. I believe her to be a driving instructor in a million. Chris was always friendly, professional and extremely patient, and my lessons were something to look forward to at the weekend. It was easily one of the best experiences I've had so far. It has given me so much more freedom. My lessons were exciting and dynamic - no two days were ever the same on the road. Chris is a great lady and I owe most of my confidence on the road and driving ability to her. I even received a card from her in the post congratulating me on passing my test with little tips and reminders which I thought was a really lovely touch. Although I was overjoyed on passing my test, I was sad to say goodbye to Chris and to stop lessons :( However, I enjoyed lessons so much that I may contact Chris in the future re pass plus!! "Hey Chris! 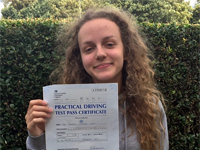 Just wanted to say thank you very much again for helping me pass my driving test this time :) What others couldn't manage - you did! For anyone out there who is thinking about taking a test I only have these words: CHRIS IS THE BEST. She is very patient and knowledgeable, always on time for your lessons, gives honest feedback and genuinely cares for her pupils to pass on their first attempt with her. Chris will not only give you the tools to pass but will teach you how to be a confident and safe driver for years to come. You will probably have to wait a while for Chris to become available but it will be worth it :)"
So pleased, still can't quite believe it! Thanks so much for all you help. Thank you so much for my card and thanks for being a brill instructor Chris, I would recommend you to anyone. Just wanted to say thank you so much again. You were brilliant and I'll recommend you to anybody. Take care.